You guys! I have been radio silent for the last week and I’m so sorry. I have so many posts I’m working on right now in preparation for holiday shopping and you’ll have to forgive me but I’ve been sick and busy with real life stuff. But while I haven’t been here I’ve been using a lot of makeup and skincare and some new favorites I want to share with you. I haven’t called anything out as an absolute must have favorite in a hot second so I thought we were due. 1) Take the Day Off Cleansing Balm– At my most recent eye exam, the opthamologist noticed that I had a lot of oily residue on my contact lenses. I’m starting to wonder if cleansing with oils has been affecting how clean I can keep my lenses so I’m switching it up a bit lately. This cleansing balm is a solid and the consistency is a lot like coconut oil. My makeup dissolves right away when I use this so I am loving it. This is actually my second jar of the stuff, my first jar lasted a couple years! 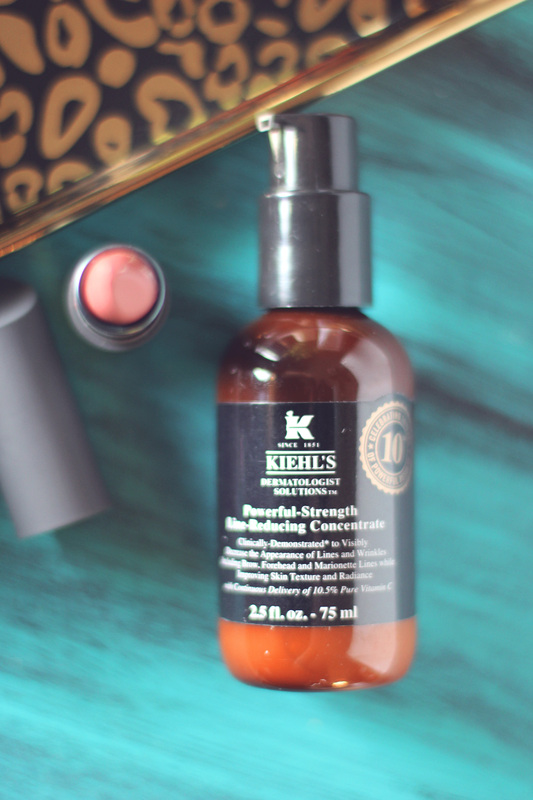 2) Kiehl’s Powerful-Strength Line-Reducing Concentrate– This has been an all time favorite of mine that I wrote about in my latest skincare post. Using it morning and night I’ve already gone through a bottle this fall, and I replenished with their Ten Year Anniversary edition bottle. This year, Kiehl’s celebrates ten years of powerful results with this formula and just sold its 3 millionth bottle of the formula. I’m not at all surprised it’s that popular. It certainly gets a gold star from me! 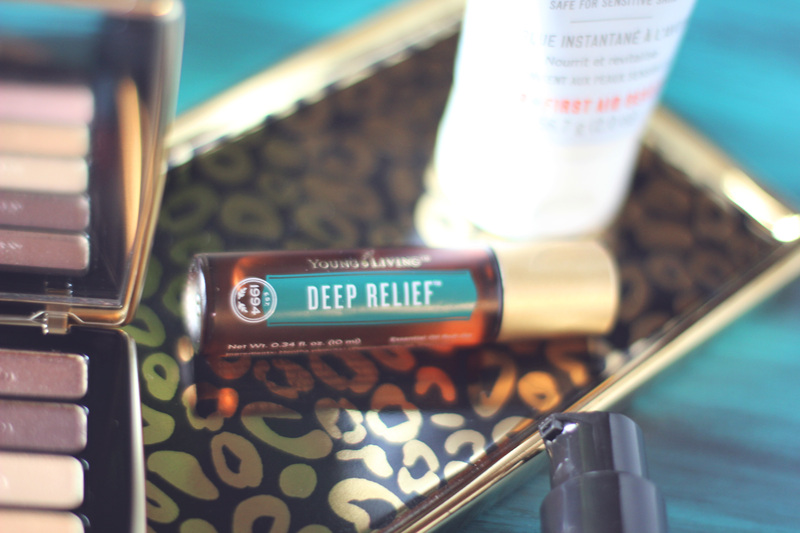 3) Young Living Deep Relief roll on– This is really meant to be used for massage after activity but I’m using it when I have a sinus headache from being sick. Last week my husband was on the brink of a cold and used this several times, and he swears that was all he did to avoid sickness. I gave it a whirl this weekend and while I wasn’t cured completely it did take the edge off. Some of the main ingredients are peppermint, wintergreen, copaiba, helichrysum, and dorado azul. Now that I’m full blown sick I am diffusing Thieves like it’s going out of style too. 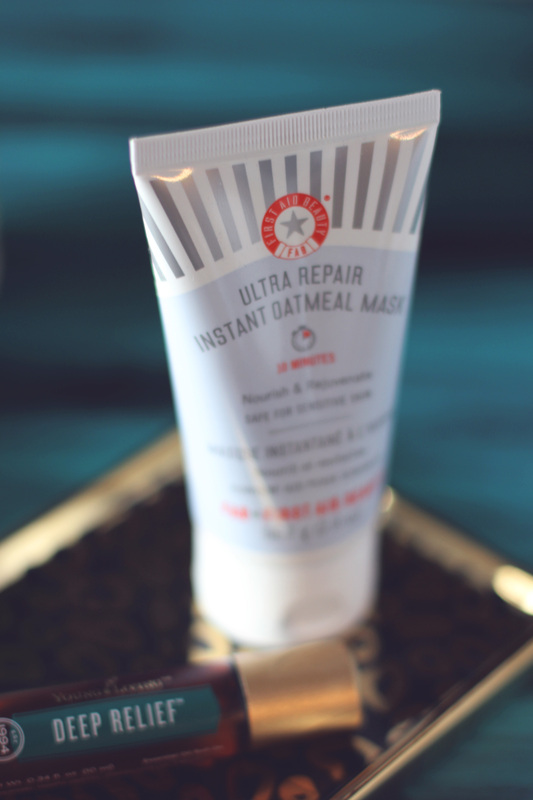 4) First Aid Beauty Ultra Repair Instant Oatmeal Mask is a lifesaver for dry skin. You only need to wear it for 10 minutes to get the great results. The formula is made protective oats, colloidal oatmeal and avena sativa oat bran as well as a blend of botanical antioxidants. When I was going to put on my night time moisturizer I realized how soft and smooth my skin already was and was pleasantly surprised. I can tell this will be getting a lot of mileage this winter. 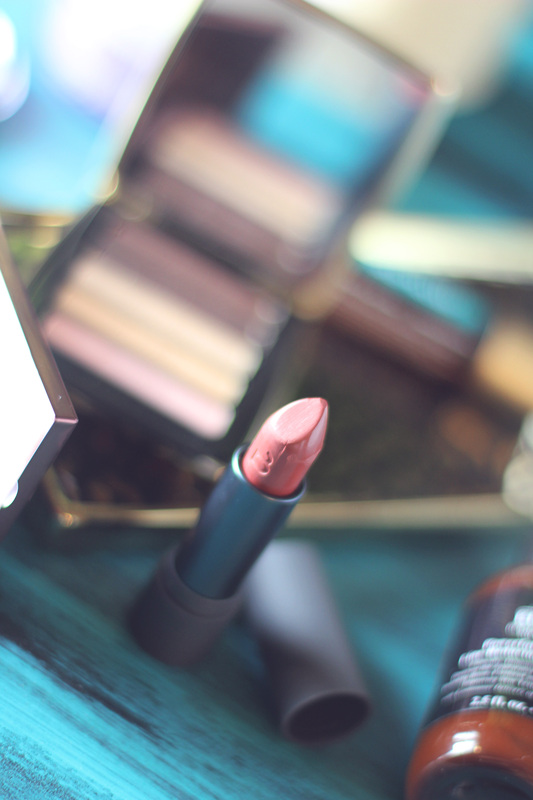 5) Guerlain Eye and Blush palette– Um, hello gorgeous! 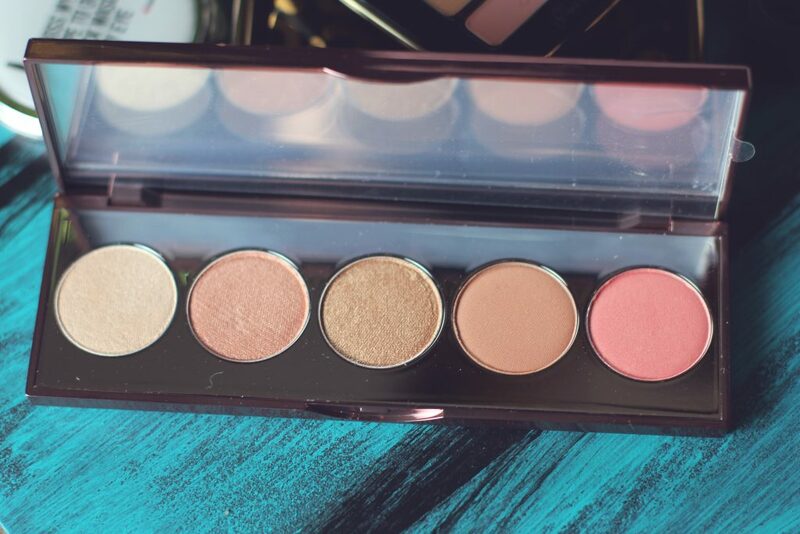 This is a limited edition palette that features a layer of eyeshadows and a layer of blushes. The eyeshadows range from natural to smoky- we have champagne, brown, gold, plum, and pink, and the next layer contains pink blushes in shimmer and matte finishes. The packaging is brushed gold and has a large mirror and I’m pretty much in love with it. If you are wondering what I’m wearing from now on this fall, it’s probably this. LOVE. 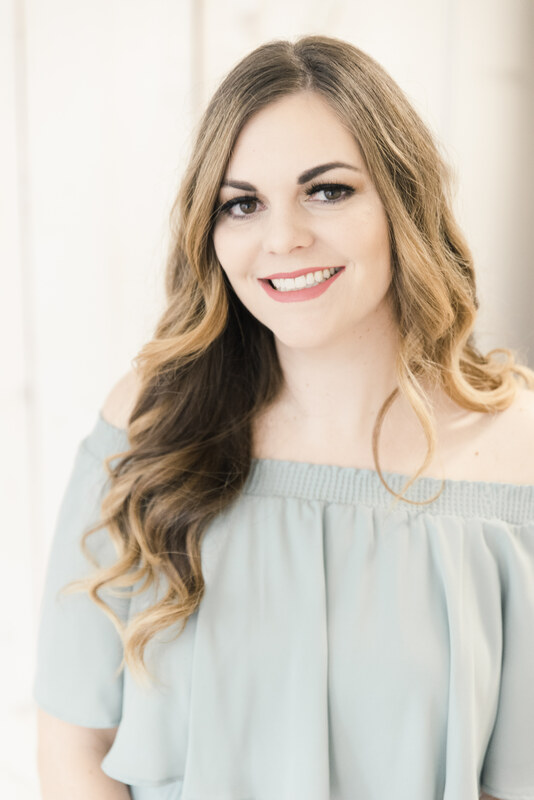 6) Becca Afterglow palette– This palette is available at Ulta and contains some of my absolute favorite products and five of Becca’s best sellers. In this palette are the Shimmering Skin Perfector Pressed in Moonstone, Rose Gold and Topaz, and the Mineral Blushes in Wild Honey and Flowerchild. I own all but two of these shades, and can I tell you, this is such a phenomenal value. I never ever use up a full pan of product, so to get to try all five of these beauties for $39.50 is an incredible savings. 7) Last but not least I am absolutely in love with the Bite Luminous Créme Lipstick in Pepper. It’s a dusty rose shade that ends up being an absolutely perfect dusty rose shade on me. I have the holiday Mix and Mingle sets and if you’d rather have a mini you can try this side by side with the shade Café. So, that concludes my favorite and most reached for products for this Fall. 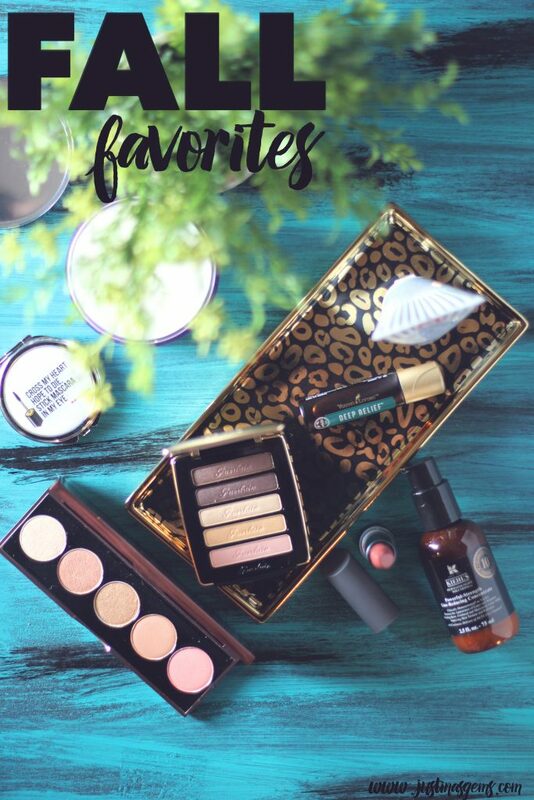 After not posting much for a week, I am a bit behind as you can imagine, but I have several new reviews for you, including all of these products come up before the holidays. Stay tuned if you’re curious about one of these products or ask me about them in the comments. What have you been reaching for this fall? Were any of these items a favorite of yours? 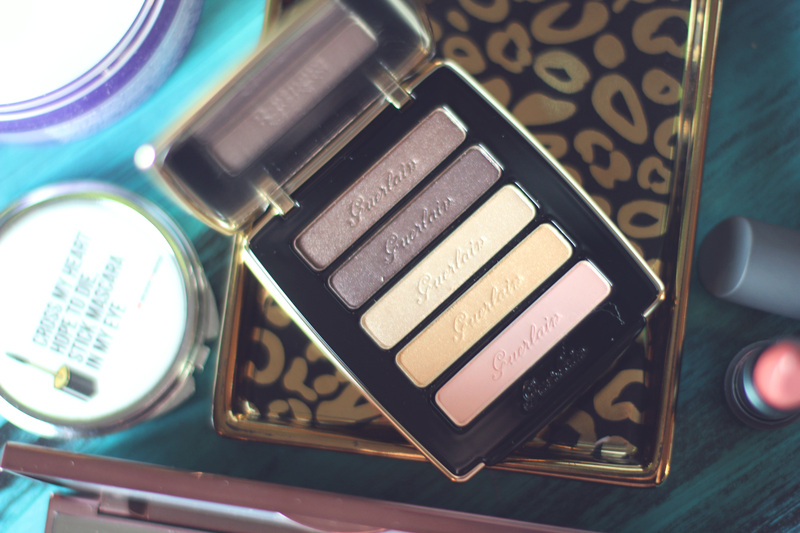 I totally want that Guerlain palette! The Guerlain palette is amazing, and I have already talked 5 people into buying it in real life heheh (as opposed to blog life hehe). Great choices! What a lovely faves list. I’ll have one of each, please. I love First Aid Beauty Products; I need to try that mask. That cleansing balm is a HG for me, but I go thru it way too fast lol. 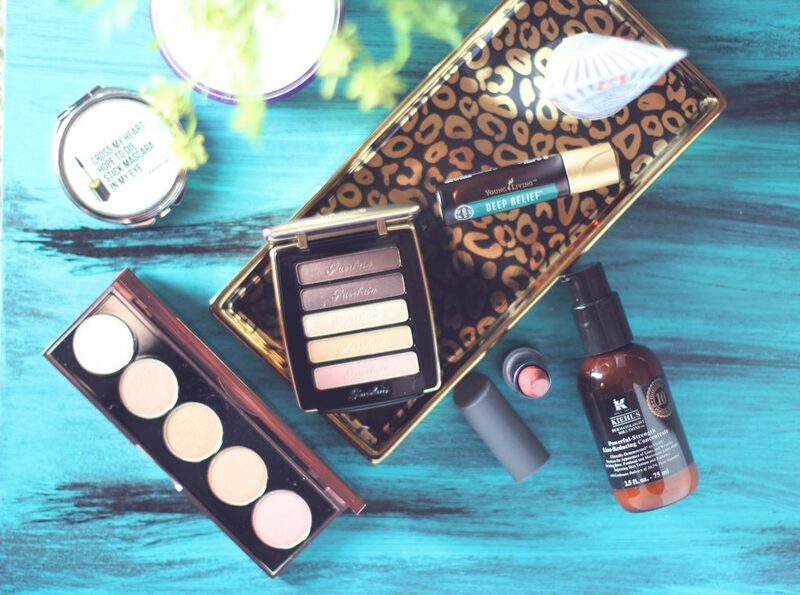 The Becca and Guerlain palettes are in heavy rotation here too. I need to try that Bite lippie shade and the Kiehls! Oooh on the Guerlain. That really is beautiful. I love the look of the Becca but I just bought their highlighting palette so I don’t “need” that one. I want that BECCA palette even though I have the two blushes LOL! Bite Beauty lipsticks are some of my favorites! 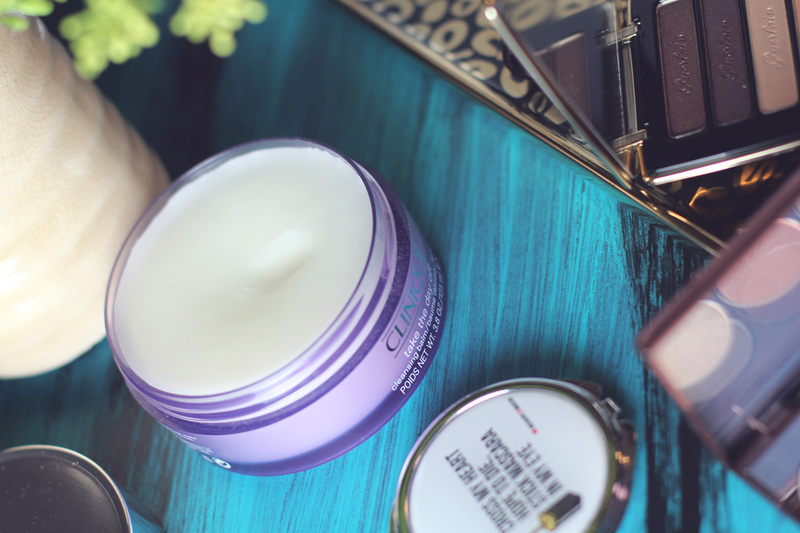 The Clinique cleansing balm has been on my list of products to try. Great picks! I have a similar palette from Guerlain from last year’s collection. I skipped this year’s because everything looks the same. Such a great selection of products. That Guerlain palette is gorgeous. I may as well just say I want it all!!! I’ve got to try the cleansing balm. Nordstrom has a Clinique gwp coming up, just in time. Bite’s lipstick is an ongoing fave of mine! I want the BECCA Afterglow palette!!!!!! Drooling over the Guerlain here. I need something like the Deep Relief roll-on now; my nose and throat have been stuffy and sore for a couple of days. I’m loving the shadows. I also have some Kieh’s on my fall must have list. Great picks! 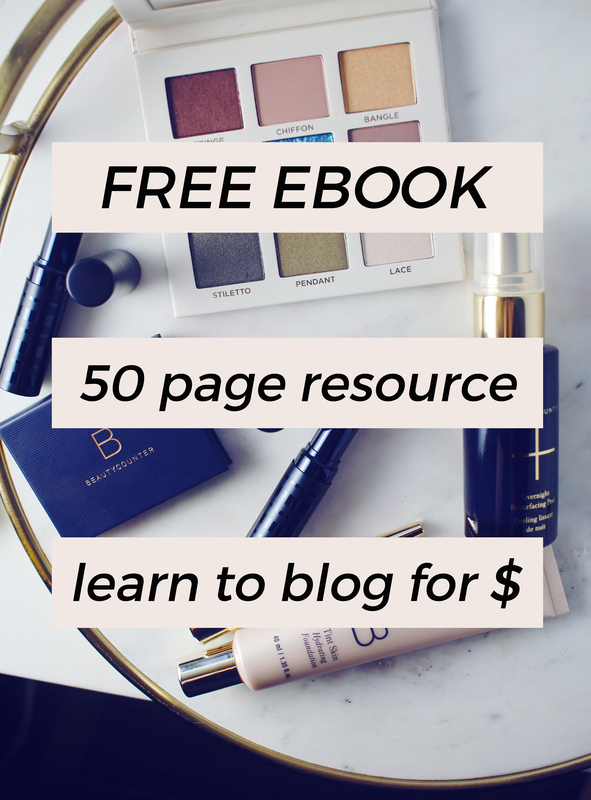 Lots of things on here I’d love to try – the Becca, Guerlain, the cleansing balm… can just come over and play with your makeup? The mask by First Aid sounds awesome. Do they also sell this at Sephora? Yes they do! I’ll let you try it this weekend.